Summer is officially over, but California doesn't seem to know it yet... The air conditioning is on full blast, I'm still sweating and the only thing I want to do is soak in the nearest pool. Here's my last hurrah to summer before I dive into autumn baking, warm spices, and apples, lots of apples...maybe if I bake enough yummy fall treats California's weather will follow along? 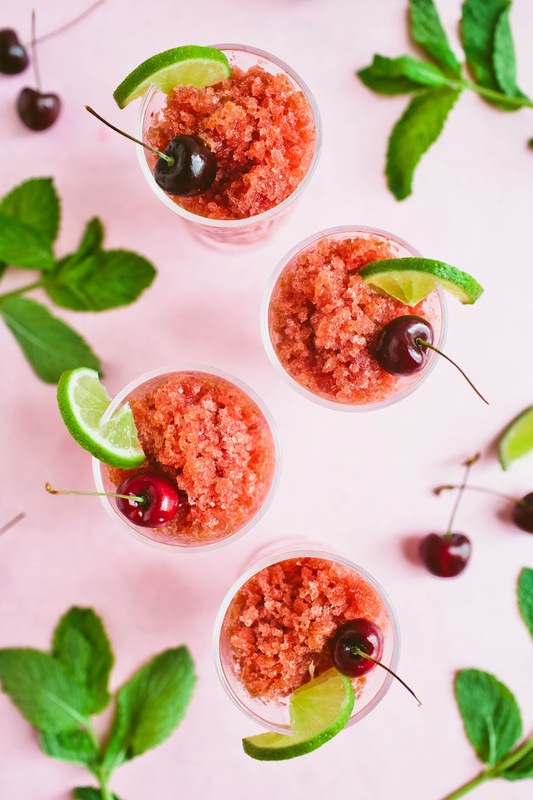 Inspired by one of my all time favorite drinks, this cherry limeade granita will keep you cool during the hot summer days. 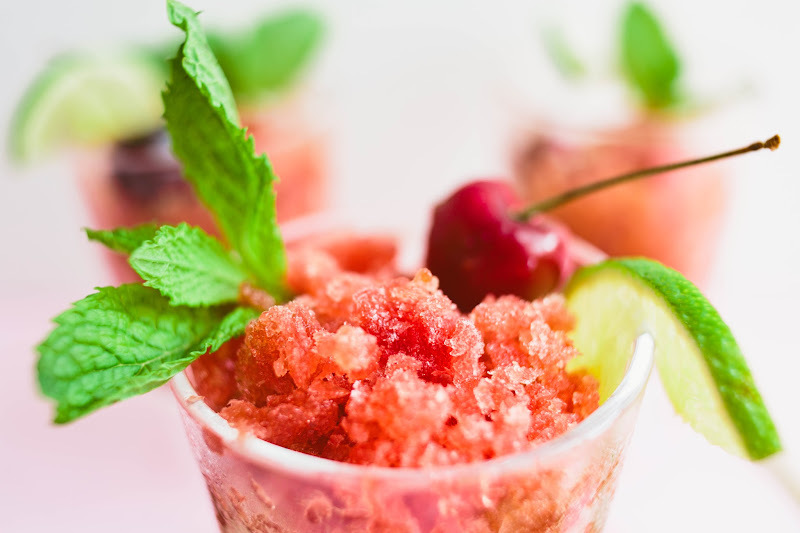 Although it may need some patience, this icy treat is super simple to make requiring only a few ingredients. 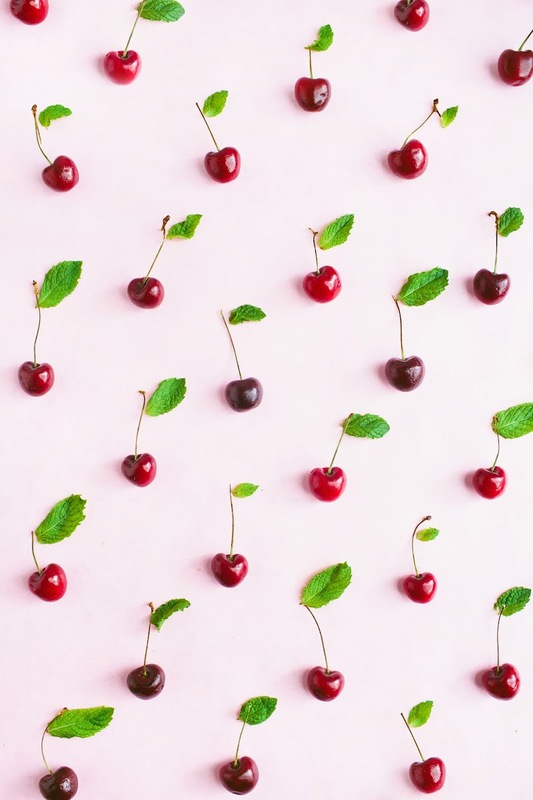 • Begin by prepping your 2 cups of cherries by giving them a good wash and pitting them. If you don't want to spend hours cutting your pits out or don't have a pitter on hand (like me), you can be creative and use a simple paper clip to pit them! I felt like I conquered the world when I discovered this tip, a quick video how-to here. 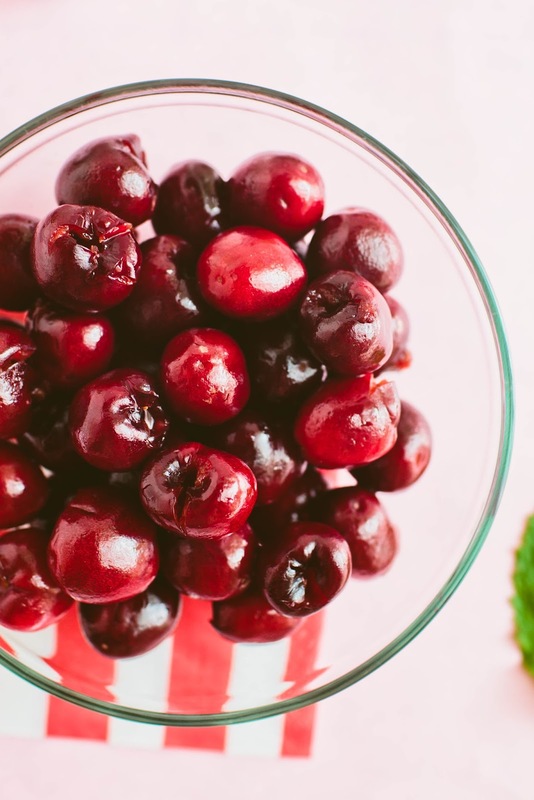 • Next, in a food processor or blender, puree the cherries until smooth and add in the lime juice. 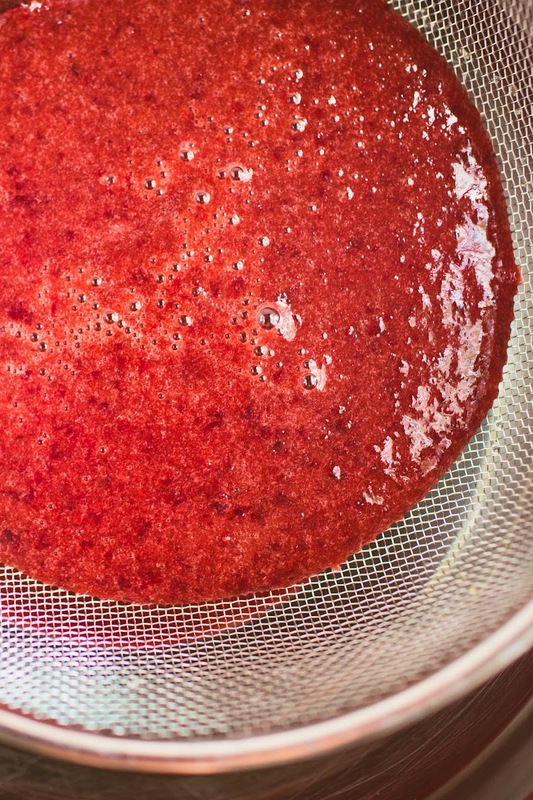 Strain the liquid with a mesh strainer and then set aside. 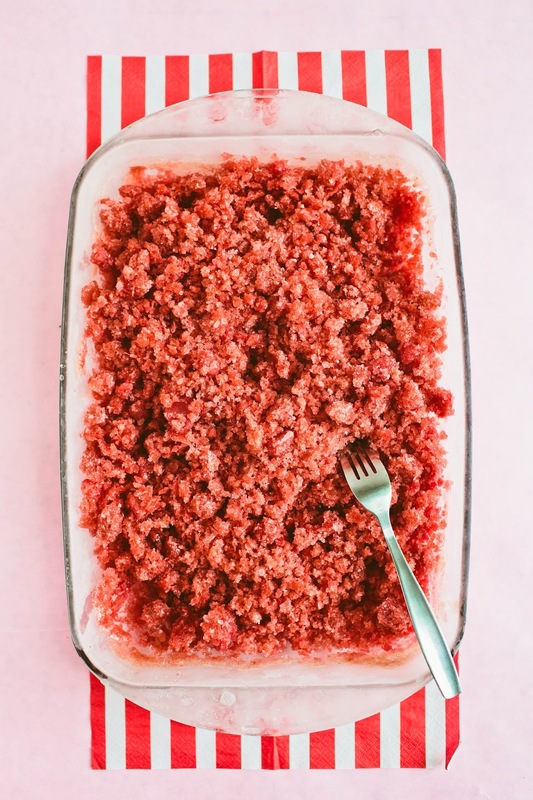 • Next step is making the simple syrup to go into the granita mixture. Simple syrups are equal parts water to sugar so in this case we will be using 2/3 cup of water & 2/3 cup of sugar, and to make it extra special we will be infusing it with mint. 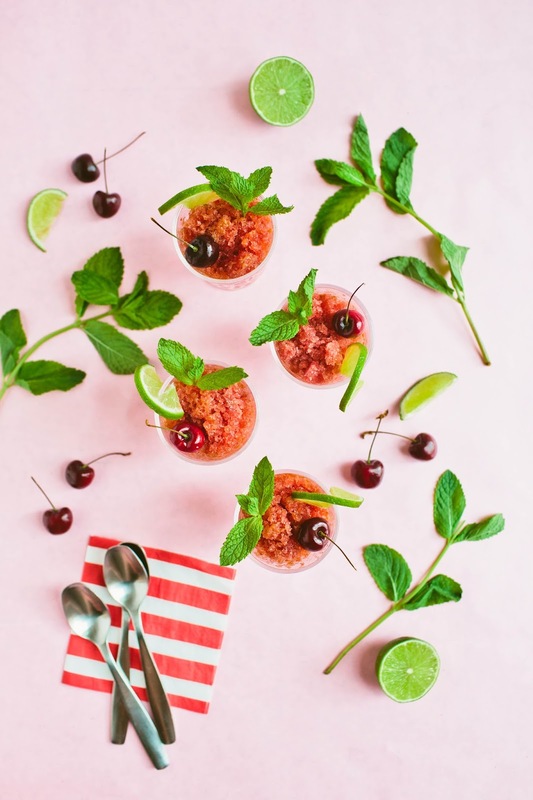 In a small saucepan, combine the sugar and water and bring to a boil over medium-high heat, stir to dissolve the sugar and once it starts boiling turn down the heat and add in the sprig of mint to infuse the simple syrup. 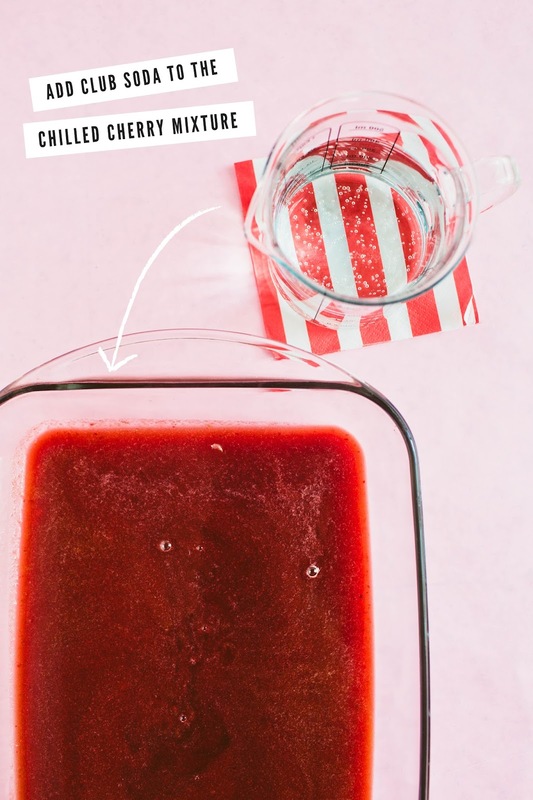 Once the sugar has completely dissolved, remove from the heat and combine with the cherry/lime juice. Chill mixture completely. 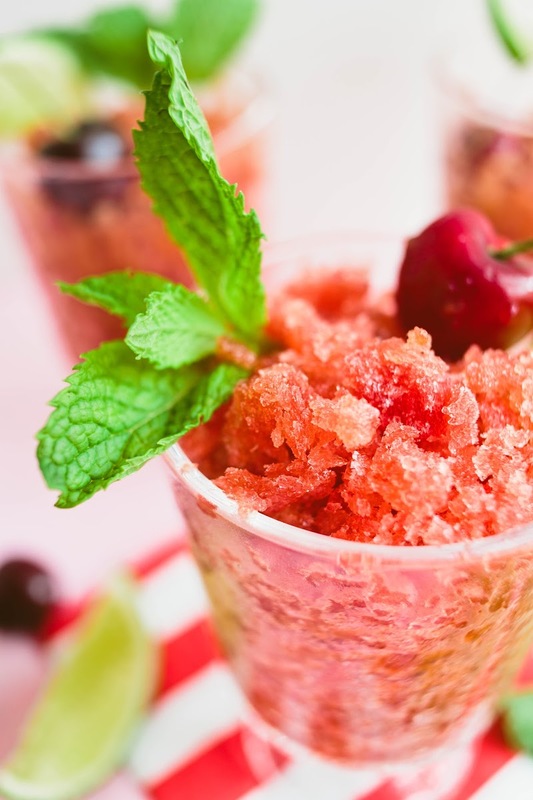 • In a 11"x13" dish, combine the cherry/lime mixture with the 2 cups of club soda. 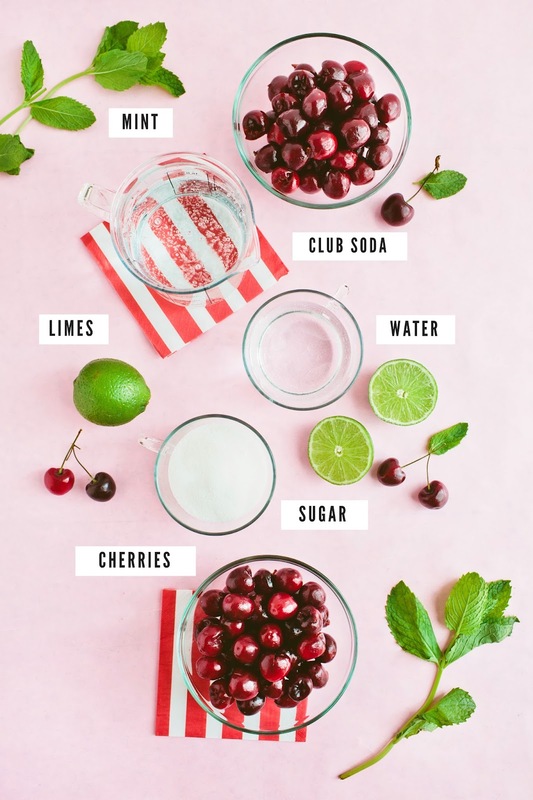 You can increase or decrease the amount of club soda to your taste. Place in freezer. 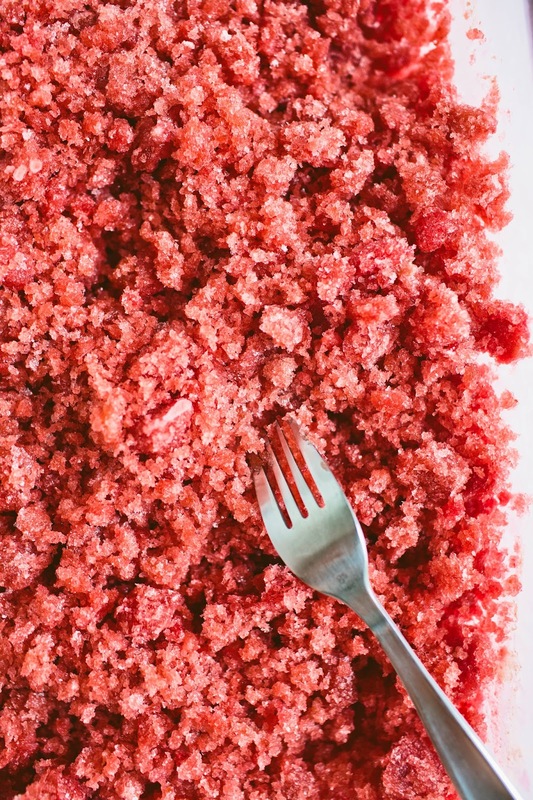 • After your mixture has been in the freezer for 1 hour, use a fork to "scratch" and break up the frozen bits and pieces. Repeat this process ever hour until all of the mixture is frozen, about 4 hours. 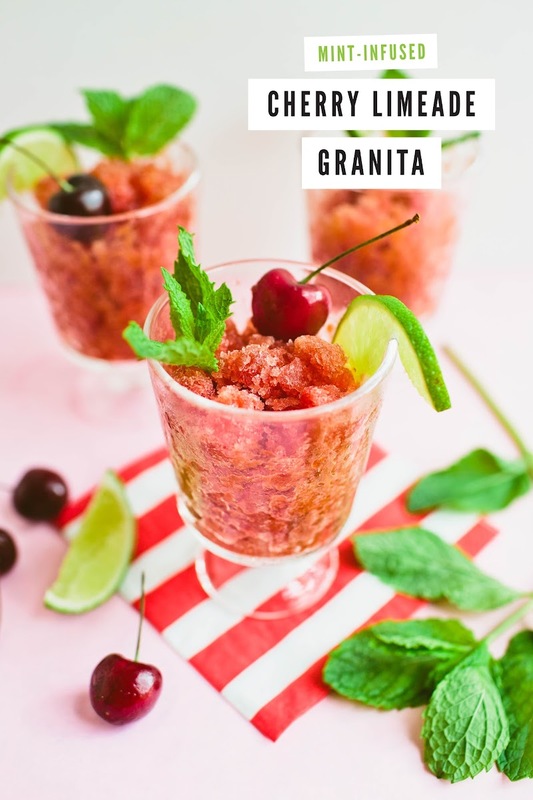 A granita is to be made up of thin ice crystals, the consistency is one of my favorites and it makes your frozen treat a little more fancy. This is what the final product should look like. Light fluffy ice crystals, yum! 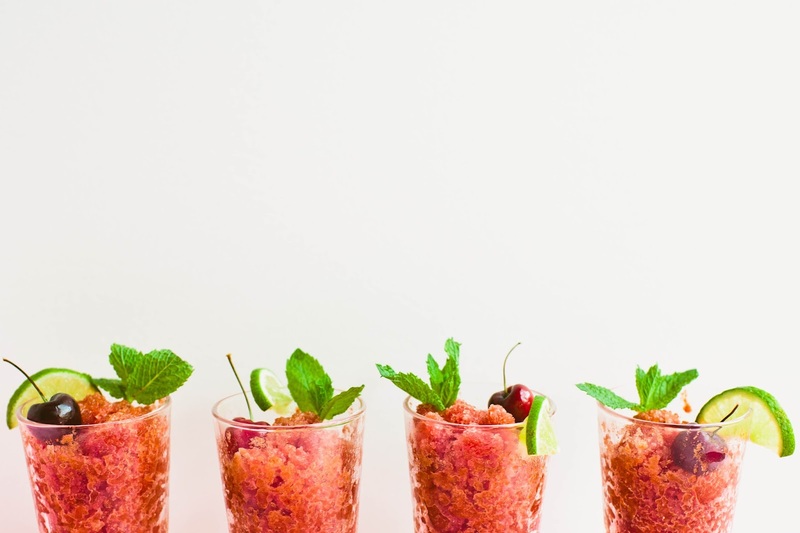 Garnish with a sprig of mint, cherry or lime slice or all three!